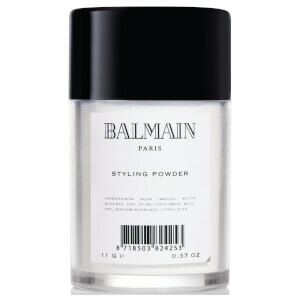 Transform limp, lifeless locks with the Balmain Hair Styling Powder; a body-boosting formula that works to add texture and definition without added weight. Ideal for braids, up-dos or creating enviable volume, the lightweight powder lifts hair from the root for instant body and fullness. Delivers a long-lasting, matte finish with no flaking or greasy residue. Suitable for daily use and all hair types. Distribute into dry hair and use the fingertips to work the product into the roots to create instant body, fullness and texture. To add more body and definition to the mid-lengths and ends, apply a little Styling Powder on a brush and work through the hair. Only a small amount is needed to achieve noticeable results. Aqua (Water), Silica Silylate, PVP, VP/VA Copolymer, Alcohol, Sodium Benzoate, Citric Acid.